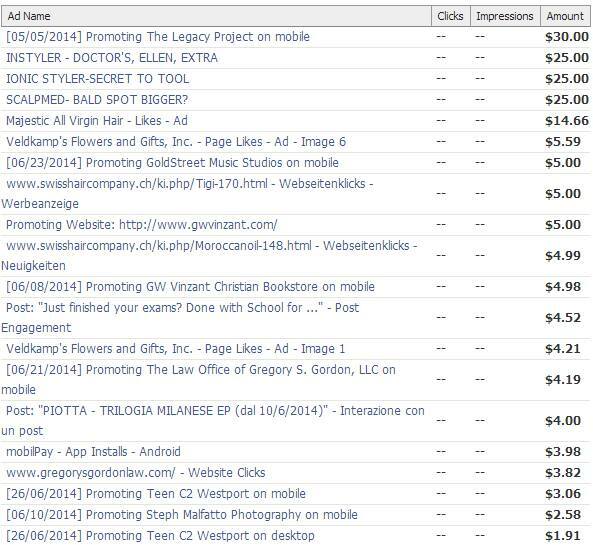 Last night a sizable number of Facebook advertisers received receipts listing other people’s ads, including company names, campaign names, and amount spent. Sources tipped us off to the bug, and Facebook confirms to me it occurred and was fixed in about two hours. The company also confirms that no one was charged for other people’s ads, despite one victim claiming otherwise, and ad delivery wasn’t affected. The gaffe could shake confidence in Facebook’s advertising system. Essentially what happened was that a portion of Facebook’s advertisers who were sent their regularly scheduled ad receipts while the bug was active last night got an email containing other people’s company names, campaign names, and the spend from their last billing period, as seen above. If they clicked through the links, they’d be denied by the Facebook Ads Manager and not allowed to see or change the other people’s ad campaigns they were emailed. Facebook says it’s about to send a note explaining the situation to those impacted, but hadn’t publicly admitted the issue as of press time. You may have received email receipts for advertising charges unrelated to your account. This was the result of a system issue that lasted a couple of hours yesterday. We want to assure you that you’ve only been charged for ads that ran on your own account and that this issue did not affect your ad delivery. As always, you can find more information about your recent charges by visiting your Advertising Account Billing Manager at http://www.facebook.com/ads/billing.php and clicking on the individual transactions listed. One customer who was hit with the bug and called Facebook’s ad support hotline was told that 20,000 advertisers were affected, but Facebook couldn’t confirm that number to me just yet. While the data the bug exposed wasn’t highly confidential, it’s still a breach of privacy. Knowing a company is running ads for something and how much they’re spending could help competitors and cause other problems. Facebook will need to lock up its systems and respond more quickly to issues like this to keep the faith of advertisers that pour $2.27 billion into the social network each quarter.